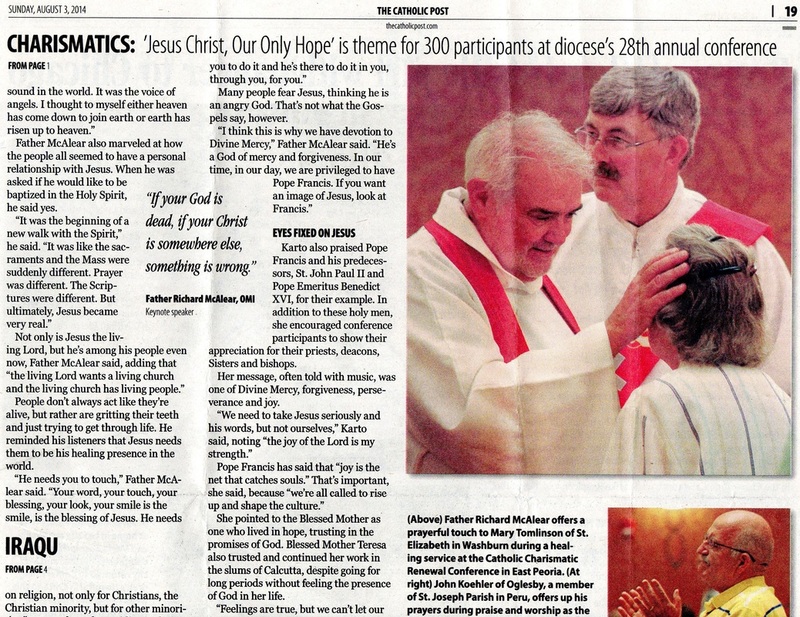 Below are a few of the many articles that have been written about Fr. McAlear and his Ministry of Hope and Healing. September 05, 2015 4:00 am • Bev Pechan Journal correspondent If you go For more information or to register for the retreat, contact Beth Strain at 342-0507. An 18-part course on the Rev. Richard McAlear’s healing ministry is available free-of-charge online at frmac.org/listen-to-ministry-healing-course-for-free. 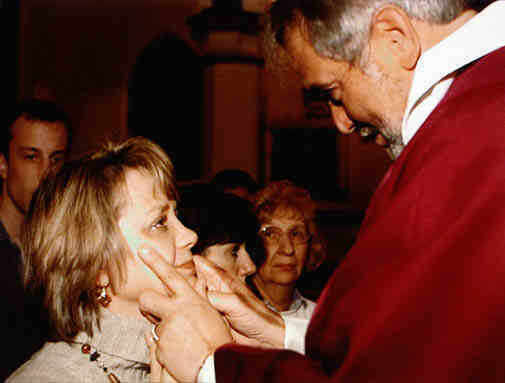 “People have said they see Jesus’s eyes in his eyes,” Halina Hladysz says of the Rev. Richard McAlear. 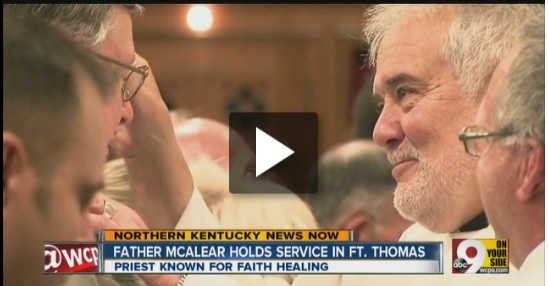 Her family is one of thousands who have witnessed “Father Mac’s” healing power by watching loved ones made whole again after attending one of his prayer masses or healing retreats. McAlear is holding a healing retreat titled “Come to Me All Who Are Weary” from Sept. 11 to 12 at the Cathedral of Perpetual Help on Cathedral Drive. McAlear has previously offered messages of hope in Rapid City in 2006, 2009 and 2011. So far this year, he has traveled to Australia and held retreats in at least a dozen states and Sao Paolo, Brazil. There is no charge for the Rapid City retreat, and it is open to all faiths and people from all walks of life. Originally from the Boston area, McAlear says on his website that he experienced his first healing miracle when he prayed for a dying woman who recovered. “I have a ringside seat to something going on. I know something is going on. Something is happening,” he said. Hladysz and her late husband came to the U.S. from Poland about 30 years ago. For 16 years, she wrote a column for the Journal on health and healing. Several years ago, Hladysz learned that McAlear was going to hold a retreat in Yankton and she attended, carrying a letter in her hand she hoped to present as a healing prayer request for another person. A few weeks later, the Hladysz family received a postcard from McAlear, telling them that he had the photo she had given him on his desk and was saying prayers for healing. “He goes all over the world. I didn’t think he would personally acknowledge us," Hladysz said. Hladysz said that while she cannot compare him with Jesus, McAlear's lifework is very similar as he goes out among the people, offering prayers and words of encouragement to help them deal with personal burdens. Numerous testimonials are posted online from those who have seen positive changes and healing. Many are from cancer sufferers who claim they have been cured. Before leaving for Rome recently, the Rev. 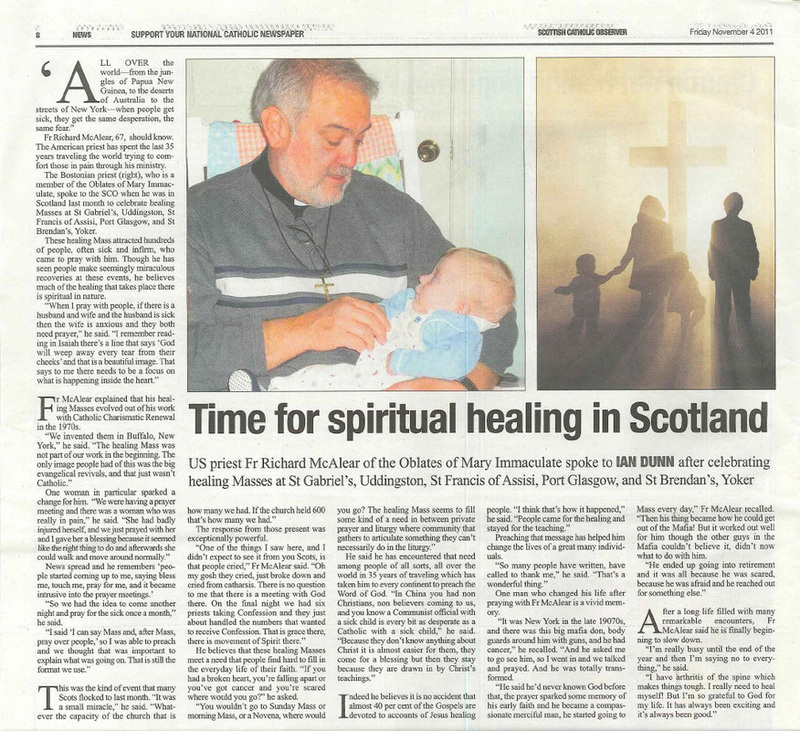 Michael Mulloy, rector of Our Lady of Perpetual Help, said "healing is something desperately needed in our world today. We have marvelous abilities to heal physically, but the healing of spirit and soul requires more than our human ingenuity. Father McAlear has been gifted with being a channel of God’s mercy and love. evening, where he held a service at St. Thomas Church in Fort Thomas. He prayed for all 200 people in attendance. years ago, when he prayed for a woman who was dying and she was cured. that they truly believe in Father McAlear's power of prayer and healing. McAlear. Krenner has followed Father McAlear's ministries for more than a year. almost want to fall backwards." no teaching or background in prayer. "It scared me more than it scared anybody," Father McAlear said. Margie Neltner saw Father McAlear for the second time Thursday. "It's such a blessing that he's so gifted." 150th anniversary of the Marian apparitions in a small grotto. water is said to have delivered physical healings to countless people since St.
Bernadette Soubirous brought it to the world’s attention in 1858. But millions cannot get to Lourdes. Where do they go for hope and healings? 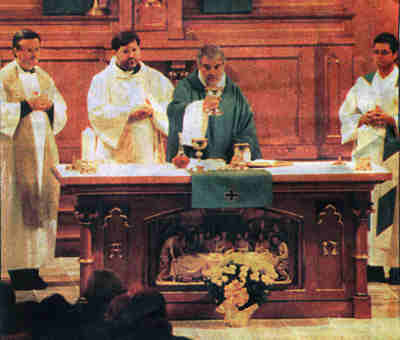 Anywhere a healing Mass is celebrated. And what should the “hopeful faithful” expect at these sacramental services? Certainly not the sort of theatricality and histrionics seen on many televangelism broadcasts. and end all” of the sacrament of the anointing of the sick. Sometimes these healings combine the physical and spiritual in astonishing ways. One stands out for John Botaish, president of the Lourdes Marian Center in Denver. Center’s recently retired Father Michael Walsh. And then there’s the Marian-intercession aspect of healings at Masses. to him as a young boy. a bottle of water from Lourdes. today, God enabled me to do the one thing I need to do as a priest: say Mass. answered God’s call to the priesthood. One needn’t travel to France for that greatest of all healing touches. April 30 was not out of the ordinary. few months sharing his gift with the Southwest Florida community. and be prayed over. Most, McAlear said, choose to stay. I just wanted him to give Mary Grace a blessing." 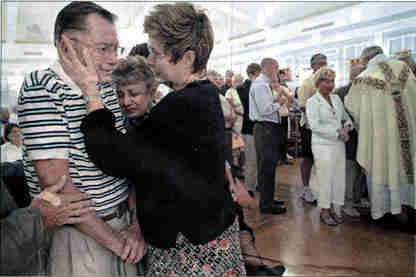 time I took my mother-in-law, coming to a healing mass." she said. I need to come and share." McAlear said. "There are quite a few lay people who have this gift,"
presence, in the mission fields there's healing galore." healing. 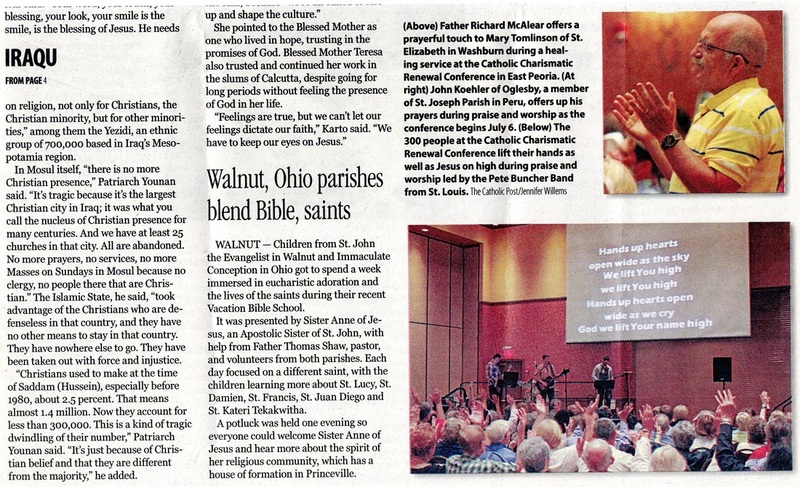 "Father McAlear is the instrument for God to heal hearts,"
needed - and said she received - emotional healing. is a member of Oblate of Mary Immaculate order. calmness when McAlear visits the church. health professionals, including pastoral care workers. We must always go back to placing Jesus in the centre. healing gift would be strengthened in a special way. services around the world, has a large following here. Rather than see a river of hurt and sorrow, the Rev. or release, of some hunger assuaged. the same everywhere he goes. holds the people of this community in his hand and heart. of forgiveness are real works that engage the heart and soul. and in prayer, struggle with the Father's Will just as Jesus did. struggle, however, like the decision itself, is spiritual. so as to embitter Him or destroy Him. Forgiveness returned love wherever injury was received. "we proclaim the death of the Lord," St. Paul says. corners. We offer ourselves just as we are. one's own heart on the altar. in the pain of life with all its hurtful dimensions. need for healing and our desire to forgive. the bread and wine become the Body and Blood of Jesus, the Crucified One. taken up, consecrated and so become the Body of Christ. Each person is being claimed by Jesus as His very own. grace. Our hurts and wounds have become His. longer ours alone, it is His. embraces all in unity and in peace. Charity where all are reconciled and united by love and forgiveness. hope is in Christ Jesus and the power of this perfect gift. to express gratitude and simply be thankful for saving grace. grace and been touched by Mercy. pardon and seeking unity as the fruit of mercy. Freely received, mercy is freely given. faces, anoints them with blessed oil. draw hundreds to St. Louis Church in Pittsford tonight. often physical stuff can go away, too." hundreds who come to him. a national group of doctors, nurses, clerics and others. McAlear on several trips overseas. a silence that penetrates your very being." "Suffering does not have to destroy you," McAlear says.